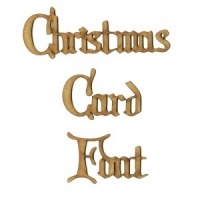 Create your own word, name or phrase in Christmas Card font - ideal for seasonal and festive projects. Custom words make your projects extra special - personalise a keepsake, gift or plaque with a name - add a place you've visited to a scrapbook page or journal... endless possibilities! PLEASE NOTE: These words are not freestanding. We can also offer a complete customisation service if you require names or words to be engraved or cut to a different size. Please fill out a custom enquiry if you require this service.